Sign up to become a Duck Dynasty Duck Scout. 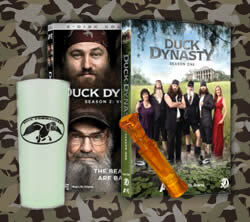 Once per month, 5 random Duck Scouts who have earned 1,000 points or more will receive a Duck Dynasty Survival Kit that includes a duck call, Si’s tea cup, S1/S2 DVD, and a Duck Scout patch! My nephew just starting watch the show and cant get enough he went on line and order him a book he just 11 He would be so so excited to get this.